Living in Arizona has exposed us to some desert creatures. 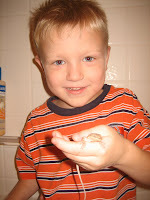 Matthew still has his "Lizard Hunter" skills, and caught this one out on the wall. Benjamin was ecstatic, and laughed when I suggested we call him "Speedy." "Peedy! Yah mom, we call him 'Peedy! *hee hee* 'Peedy." "AAAAAAAaaaaaaagghhhhaaaAAAAAAA MATTHEW! AAAGGHAAAAH!!! GET IN HERE!!!" He came running, and I am glad to see that both of my kids stopped, eyes wide, right outside the door. YES! I've still got it - my kids will listen to me in an emergency. Good to know. "ABIGAIL, BENJAMIN! Get on the couch! There's a scorpion in the house!" Since they carry eggs on their backs, you don't squish scorpions with your shoe but rather capture them, and then flush them. 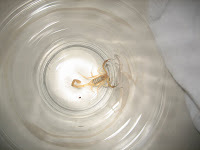 Matthew got a clear glass and captured him, then let the kids have an educational moment with the scorpion. Unlike the lizard, which doesn't bite or sting, we didn't name this guy, and he currently sleeps with the fishes. I think it makes our 4th or 5th scorpion in two years that we've found in the house. This one was pretty small comparatively. The last one we had was identified by Benjamin. Matthew didn't quite understand what he was saying about "Ders a bug dad!" "Yah, uh huh... I'll look at it later ..." That one, much like this one, just made himself at home in the kitchen, wandering around until we realized that he was there. The last thing we found lyin around in the house is a monkey! Lisa told me about these Old Navy costumes, and I couldn't believe my luck. 30%off and one in Sam's size. I love the banana in the pocket and the little tail! However, Sam hates it, and wouldn't pose for me much. Grrrr. The things you do as mom. But we did get this shot. And as you can see we're enjoying our Arizona animals! Love Speedy ('Peedy), the capture of the scorpian (who probably just smelled the delicious cookies) and the little monkey who isn't looking so little anymore. Oooo, yuck! Scorpions...The lizard is cool though! 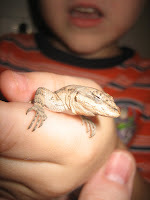 Although I agree completely, no reptiles in the house! (Nothing with more than 4 legs that can't let you know when it needs to go to the bathroom, for that matter.) I love halloween! Can't wait to see the rest of the family all dressed up! Reading this and seeing the pictures made me depressed to be a Scorpio. Ewe! 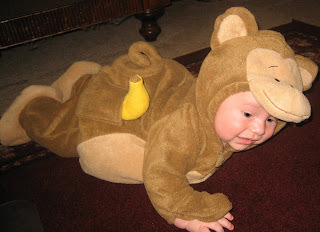 I'm LOVING the monkey costume though!!! When are we getting Sam and Liesel together? I loathe scorpions. Anywho, my mom was at our house the other day and said she saw you guys moving. Whats up with that? By the way, I also want to know about your experience at Gilbert Mercy. Do you have a doctor that you like there?